I tossed Closer To Me in my CD player and then, as I always do, I began reading the liner notes. I'm not sure at which point I was so lost in reading that I stopped listening but I have to say this, if Jake Penrod ever feels the need to take a break from music, he would be outstanding as a writer for Wikipedia. I've reviewed hundreds of albums over the years and I can't recall ever getting lost in the liner notes before. In his “cut by cut” he eloquently conveys so much passion for those who have inspired him to become a singer/songwriter, that you can't stop reading. He says that Ray Price, Hank Williams Sr., Vern Gosdin, Marty Robbins, Slim Whitman, Eddie Arnold, and more, have all impacted him. All kidding aside, if you are a fan of traditional country music, you are going to enjoy reading the album insert as much as you will enjoy listening to the album. As soon as I finished reading, I was eager to start the album over because Penrod had let me into his songwriting head and I enjoyed the journey. As I read I was introduced to a humble artist who credits any success he might have today, to those who have inspired, touched, supported, taught, and encouraged him throughout his life and career. Although he mentions it almost matter-of-factly, he is a very accomplished musician, not only did he write every one of the twelve songs on this album, his only accompaniment on this project is himself. Lead guitar, that's him. The steel, it's him. The bass guitar, acoustic guitar, piano, even the snare drum, yep, all him. He says he waited a long time to do this album because he wanted to record it “exactly as I heard it in my head.” He is not boasting or bragging as he conveys this information, and he is quick to credit every music hero who has inspired him from the beginning. He even points out, jokingly, that he “borrows and/or steals” from some of country music's greatest performers and musicians whenever he can. 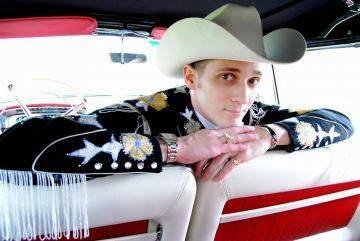 He got his start in country music back in 2009 as the creator of “Hank Williams Remembered”, a tribute to Hank Willams Sr., in which he narrates his life and sings twenty-two of his classic songs. But although he refers to himself as a “stark traditionalist”, whose singing style sounds replicated from a pairing of “Kitty Wells and Hank Williams Sr.”, I'm quite certain that as you peel away the layers, remove the scarf, park the classic car, and lose the fringe, you will soon realize that there is much more to Penrod than any “stark traditionalist” has to offer. For me, the stand out track was probably “Leave The Door Open” although I did like the title track, but then “Can't You Hear My Heart A-Breakin'” stood out too, and I really enjoyed “Big Yellow Moon”. As the album ends once again, and I read back over the titles, I realize I enjoyed the musical journey from the first track to last, since it was so easy to get lost in the music, the lyrics, or both. If you want to get closer to Jake Penrod just listen carefully to each track on Closer To Me.